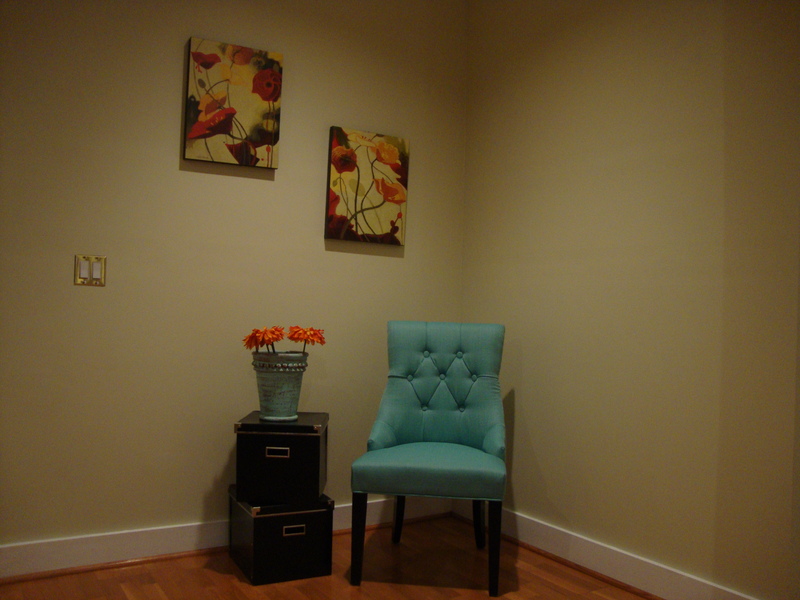 In our last couple posts, we spoke about staging for vacant properties, as well as staging for occupied homes. We discussed why staging helps listings sell, and some tips and tricks on how to start staging on your own. And, we also mentioned some ways that we pro-stagers can help you take things to the next level. The goal for great MLS photos is to act as a preliminary tour of the property. You want to provide prospective buyers with an understanding of the rooms and their relation to one another. And, of course, you want to make the property look as good as possible. A professional photographer will produce high quality images. They will use a lens that captures a wide angle view of each room, which will provide a clearer understanding of the layout. They will know how to get the best light and how to get the best angles. Stash all the last minute stuff– As part of your staging, you’ve cleared the magnets from the fridge, you’ve streamlined the wall art, you’ve packed away the majority of the knick-knacks. But, there’s those lingering items that you can’t just pack away just yet. 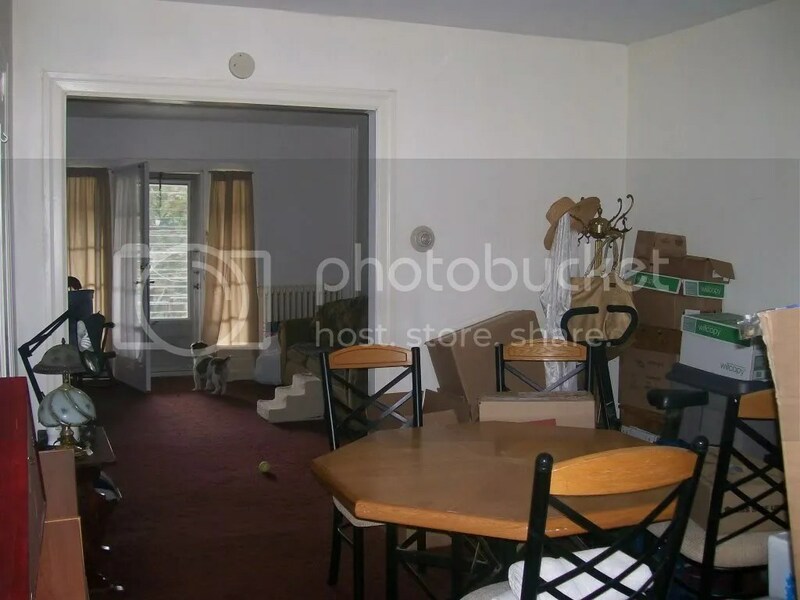 The good news is that for photos, you can hide those items in your freshly cleaned out closets. Stash the toothbrushes, shampoos, soaps. Clear towel hooks and coat racks. Hide the pj’s under the bed. Tuck away the kitchen sponge and random counter items. And, conceal the kids toys, aside from those neatly displayed in a child’s bedroom or playroom. Kate says that some clients have been known to pile additional clutter at the far end of the yard or even in the car just to get it out of the way for a great photo shoot. Lighting- Make sure all light sources have the proper bulbs. Kate says that a day with light cloud cover is ideal for shooting (as opposed to a super bright sunny day that will produce photos with harsher color contrast), but you just don’t always get that. Her preference for windows is a clean line window with adjustable blinds but no fabric curtains. Consider scale & eliminate anything that isn’t right. 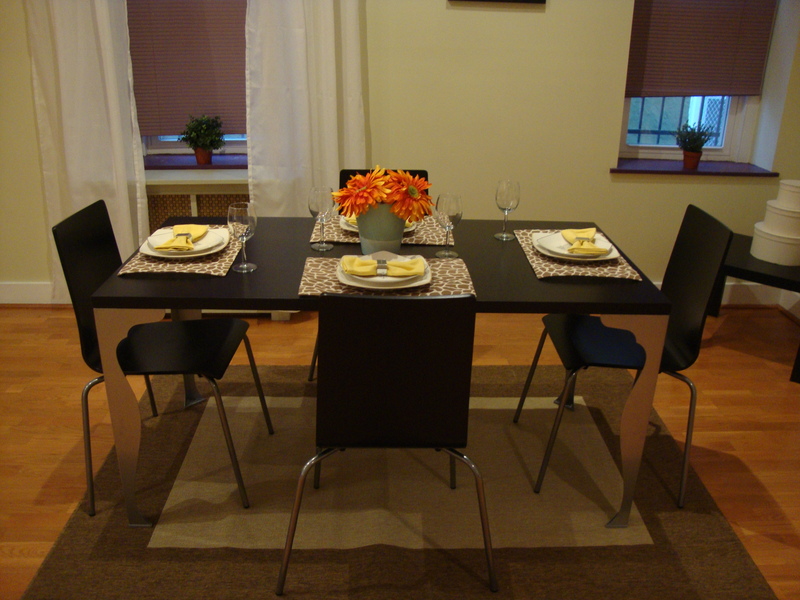 If you know your huge dining set isn’t right for the space, consider purchasing or renting a substitute that will not make the space feel small. 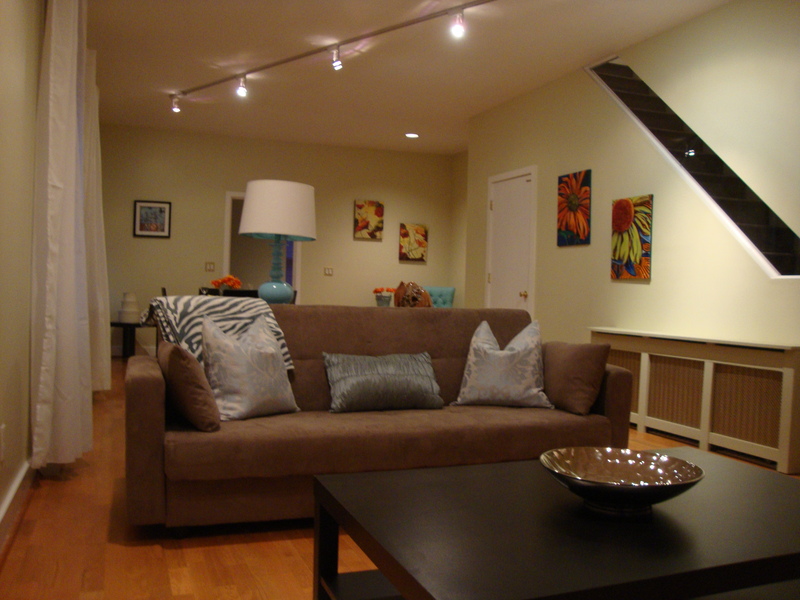 Huge pieces of artwork can also overwhelm a small space. A space-saver shelving unit can make a small bathroom look even smaller. And even something that seems as minor as a bath towel on a hand towel ring can throw off scale and confuse perception in a big way. Keep a few props on-hand. Now that we’ve told you to put all your décor away, it’s a good idea to have a bowl of fruit and a vase with flowers waiting in the wings. 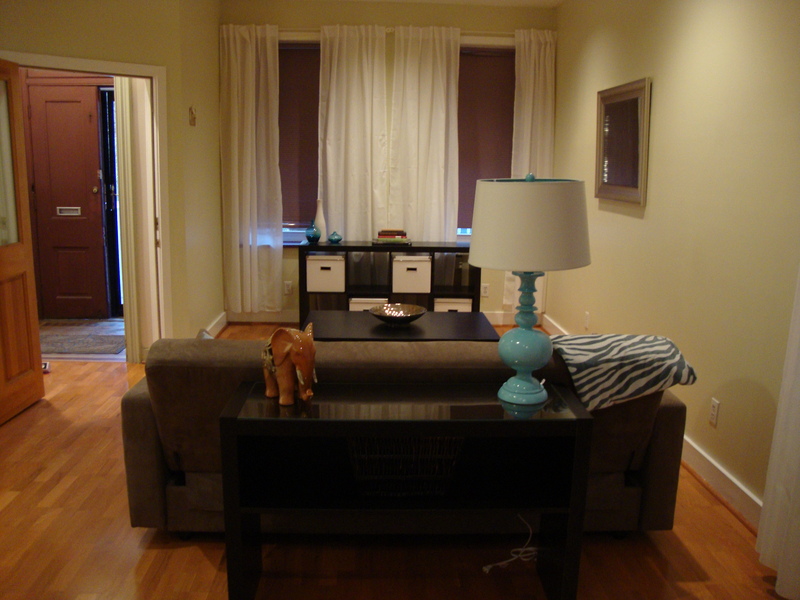 As a stager- I tend to think of décor in terms of low/wide items, and tall items. So a bowl with fruit and a vase with flowers are great props because they can fill in where needed, they move from room to room easily, and they add just the right about of color in a natural way. Fruit and flowers also tend to be easy to attain, inexpensive, and style-neutral. Know what to expect when the photographer arrives. Kate says that when she shoots, for the most part, she’ll stand at the far corner of the room and her wide lens picks up everything. It’s best if at least 1 floor is completely ready to go when she arrives so that everyone else can go to another floor of the home while she shoots. Definitely have pets corralled before the photographer arrives, and plan to keep them contained until the shoot is complete. So, thanks to our readers for hangin’ with us today! Come back next time to learn a little more about “The Staged Look”. And, Thanks to Mike McCann for his expert insights! Check out the McCann Team’s website for your home buying and selling needs. We were so excited for the opportunity to stage this vacant property located in Philadelphia between the East Falls and Manayunk border. I scoped out this property on the MLS after driving past it numerous times. I was shocked when I pulled up the pictures, the inside is absolutely beautiful and renovated. I had been picturing a “fixer-upper” and had dreamed of buying it myself and turning it into a BYOB restaurant/art gallery. I dream big 🙂 But most importantly I noticed it was vacant and gave the seller’s a call. They agreed to stage the main living area of the Victorian style home that is zoned for residential or commercial use, has parking, and is about as close as you can get to the access for 76. The only problem was the open floor plan. Without furniture it was showing like a bowling alley. We brought in some furniture and added a little tlc and now I think this house is showing at its full potential. All we need now is a buyer! Give us your feedback, we’re always looking for ways to improve and share ideas! 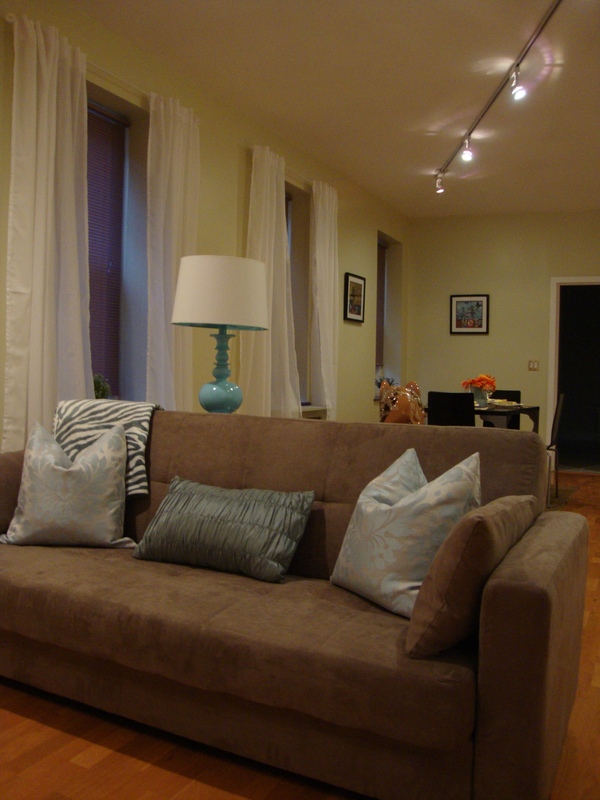 Don’t forget to check out our website for more pictures Philadelphia Home Staging.